Yes, that's right, Asian Jewels is the name of the restaurant, insert joke here. I'm not sure why anyone would want to name their restaurant that. I guess in hindsight, they probably think it's a bad idea now. All jokes aside, this restaurant is a great dim sum place to go to when you're in Flushing, Queens only because it has a wide variety of dim sum to choose from. 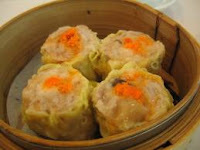 Aside from the usual shiu mai (pork dumplings) and ha gao (shrimp dumplings), they also have curry fish balls, crab meat and snow peas dumpling, and my favorite, bacon wrapped shrimp dumplings. 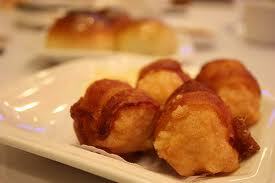 For dessert, the sweet egg custard bun is always good. 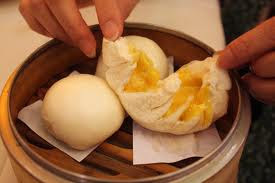 The bun is warm and fresh and when you bite into it, the warm, sweet custard starts oozing out. Once in a while, I'll also order the mango pudding. I like the way it's made here because it actually has bits of mango pieces in the pudding, not all dim sum places make it that way. The prices here are reasonable, it's $1.95 (small), $2.95 (medium) and $3.95 (large). If you order a special dish such as spare ribs or clams in black bean sauce, the price range is $6.25 to $8.50 for each dish. If you come during the weekends, be prepared to wait 30 to 45 minutes for a table. As soon as you go in, be sure to get a number from the seating hostess. There will be times when you will even share a table with a bunch of strangers if you come with a small group. It may be awkward but it works if you're there to just eat and go and don't want to wait. If you only have time during the weekend, it's best to go around 11am when there's less people. The decor is very modern and the restaurant is spacious and like any other restaurants in Flushing, the service is usually poor but fast. What's great about this place is that it offers parking. That's a huge plus especially if you're driving into Flushing during the weekends. Just remember to get your card stamped to validate your meal. Although they advertise that it's "free" parking, be sure to have some singles ready because if you want your keys back, they will be expecting a tip.